. . . To be a liberal Zionist usually means supporting a two-state solution based on the Oslo Accords, so that Israel can be secure, Jewish, and democratic without having to perpetuate the misery of the stateless Palestinian people. Both the right and the left view this position with contempt. Liberal Zionists are forced to wage war on two fronts, a reality made apparent yet again last month when Rabbi Jill Jacobs, Executive Director of T’ruah, published an op-ed in the Washington Post, in which she explains “How to tell when criticism of Israel is actually anti-Semitism.” With delicacy and nuance Jacobs staked her claim as an American progressive and a liberal Zionist, neither exonerating the Jewish state for its continued occupation of Palestinian land, nor endorsing the American left’s “Israel as genocidal empire” narrative. What ensued was sadly predictable: a social media outrage mob and a relentless attack against her emanating from the left and the right. There is neither nuance nor middle ground for the left and the right. Israel/Palestine is a zero-sum game. But liberal Zionism in America is not merely a political position. It is also an expression of American Jewish identity. Liberal Zionists believe that American Jews, much like other minorities who have suffered oppression throughout history, have the right to celebrate their Jewish pride in public. And for liberal Zionists, being Jewish includes the right to express an emotional attachment to Israel, the right to practice and celebrate Israeli culture as Jewish culture. 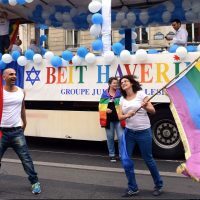 Liberal Zionists demand the right to show pride in Israel in public in America without having to shoulder the burden of solving the Israeli-Palestinian conflict. ← Israel’s Jewish? What a Surprise!